Once they were brought back from Central America by European botanists, dahlias enjoyed popularity throughout much of Europe. They were largely cultivated in Germany, where many of the first varieties were developed; when the small, bouquet-type dahlias became popular in England, they were initially known as German dahlias. So it wasn't really surprising to discover that these colorful, easy-to-grow perennials are popular in flower-loving Bavarians' gardens and public places. 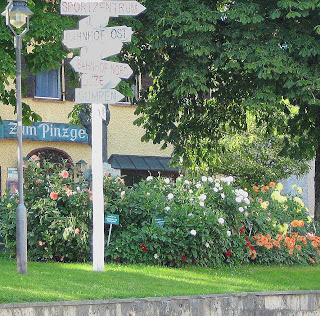 When we arrived in mid-September, it was a little late to see them in profusion, but we found them in a number of public plantings, including a municipal garden in the major intersection in Peiting, a beautiful town on the Romantic Road (Romantische Strasse) that runs south from Würzburg to Füssen. 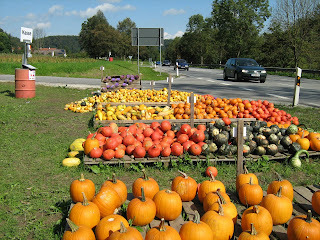 center stage in this roadside farmstand near Wasserburg. That's the honor-system cash stand at left. Bouquet dahlias are still a big thing in Germany, as well. Like Lynch Creek Farm, many growers offer bouquets of cut dahlias for sale during the summer, then sell dahlia tubers in the spring. We encountered numerous you-cut flower gardens, although most of them were close to finishing their season and the dahlias and gladiolas had been supplanted by late crops of sunflowers. Many of those we saw were operated in conjunction with a stands of pumpkins, gourds and artichoke blossoms, offered on the honor system: pumpkins were stacked on racks or in piles by the roadside, and a small kiosk for payment stood nearby. It's nice to know that this kind of arrangement worked, and it seemed to. 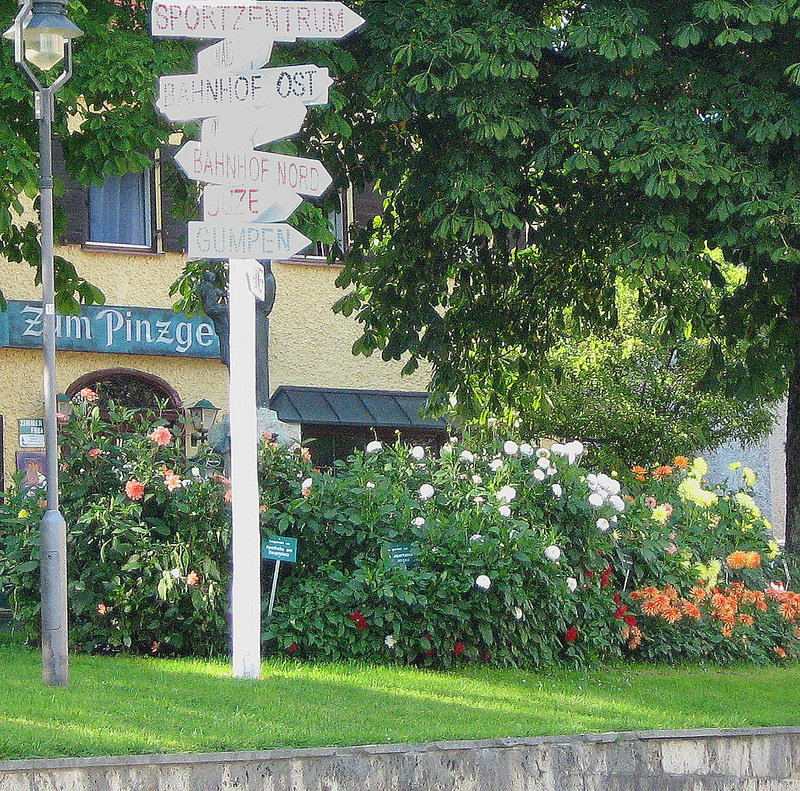 I wish we'd been there a couple of weeks earlier, when we could have gone down the rows of dahlias, choosing blooms to cut and take back to our gasthaus hosts. We still saw some beautiful dahlias in gardens and on the incredibly well-tended graves in churchyards. In the place where dahlia popularity began, dahlias still rule.